There's quite a convoluted backstory to Electric Sewer Age. Conceived as a project by John Deek of the label Divine Frequency, the idea was to create an album using multiple musicians and artists who would remain anonymous. It was to involve Danny Hyde, Peter 'Sleazy' Christopherson and others but before the project really got off the ground Peter sadly passed away at his home in Thailand. At this point Danny and Peter had already recorded and completed 3 tracks to form part of the final piece in Coil's Equinox series of singles. After discussions with the executors of the estates of Peter Christopherson and John Balance, it was agreed that these tracks would be released as Electric Sewer Age. 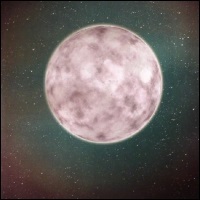 In 2012 they were released as Moon's Milk In Final Phase on Divine Frequency. John Deek the proprietor of the label then passed away in 2013. Danny Hyde subsequently self-released a vinyl edition in 2013, with the inclusion of an additional track. It sold out and has been unavailable since. This Soleilmoon edition reissues the Danny Hyde version featuring 4 tracks, with at least the first three sanctioned for release by Peter Christopherson - I'm unsure of the providence of the fourth track, 'Moon's Milk (Dark Passing)'. Moon's Milk In Final Phase, it's fair to say, shares a different relationship to the moon from the original Moon's Milk series of EPs Coil recorded with other members of the Coil family. Of course, it doesn't feature the automatic vocals of John Balance but it also eschews improvisation, drone based electronics and folk melodies for a more spacey, celestial electronic sound. 'Moon's Milk (Waxing)' is imbued with an alien / ethno-classicalism aura not too far removed from Sleazy's post-Coil solo project The Threshold HouseBoys Choir where fragmented wind instruments billow over a rhythm that appears based on xylophone sounding instrumentation as electronics chirp, chatter and chime. Otherwordly and alien, 'Moon's Milk (Waxing)' slips between worlds and is quite remarkable. Not particularly Coil-like though, it's ethno-electronica sounds like a nascent take on what Sleazy brought to full fruition on Form Goes Rampant, the sole full album from The Threshold HouseBoys Choir. Sleazy was living in Bangkok at the time these tracks were recorded working on his post-Coil projects and the revived Throbbing Gristle, and it's TG I hear in the sound washes of 'Moon's Milk (Waning)'. Completely beatless, 'Moon's Milk (Waning)' is drawn into atmospheric ambient space terrain with flurries of flickering electro chime and a wordless celestial chorus ache beating at its heart. The tugging sound washes, like treated violin sweeps that appear midway are closely reminiscent of the dramatic orchestral stabs in 'The Endless Not' from TG's Part Two - The Endless Not. 'Moon's Milk (Waning)' sits on the threshold separating Sleazy's Coil and post-Coil work. It's really on 'Moon's Milk (Eternal Phase)' you can detect glints and glimmers of the Coil vibrations that seeped into The Ape of Naples and maybe even The New Backwards. You almost expect the voice of John Balance to surface here, so Coil-like it is. Here slow sombre synths play behind ethno rhythms and chirping electronics. A distinct melancholic mood permeates this one, and for some reason, and maybe it's just the mood captured here, but the synths remind me of some of the background synth parts of 'Going Up' from The Ape of Naples. Its taken in a new direction as a flute-like wood instrument billows over the ethno ambience and chiming electronics. It's beautifully solemn and errs towards the sacred sounds Sleazy was dealing with after leaving England and the North Tower for his new home in Thailand. The original Divine Frequency edition only featured the first three tracks, while Danny Hyde appended his self-released vinyl edition with 'Moon's Milk (Dark Passing)'. 'Moon's Milk (Dark Passing)' foregoes the ethno rhythms and flute-like woodwinds for beatless celestial electronics. More abstract than the previous tracks recorded with Sleazy, it dissolves into the ether absorbing all sorts of strangeness with voices that are slowed down or take a similar mutated form to Sleazy's The ThresholdHouse Boys Choir and Danny Hyde's own Aural Rage project on Svay Pak, accompanied by synthesised strings as it ebbs to a close.